Throughout the history of ghost stories, the ghosts of famous people have been reported haunting equally famous places. American history is filled with stories of creepy and scary hauntings. Almost every community has at least one resident historical ghost. Some of the most interesting ghost stories involve notable patriots. Ever since the White House was first built, there have been reports of ghosts. Past presidents still walk the halls and occupy the living quarters of the US Capitol. 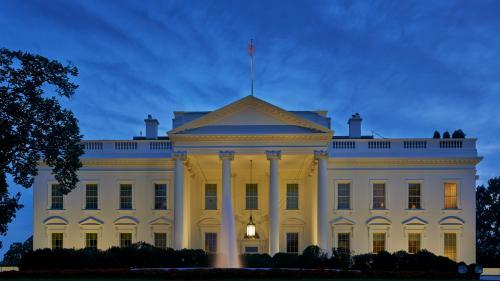 Former President Harry Truman stated that the White House was haunted, and many mediums and psychics claim that there is a vortex, known as "The White House Portal," located inside the building. President Lincoln's wife, Mary, swore Andrew Jackson haunted the White House, and on one occasion she heard him swearing as though he was angry and upset. Abraham Lincoln was a student of the paranormal, so it's no wonder his ghost has been reported haunting the White House, especially during times of government crises. Eleanor Roosevelt held séances during her husband's presidency, and it was said Lincoln came through many times in order to converse with the first lady. Other White House residents have admitted to sensing Lincoln's presence, or seeing the ghost of his son, Willie, who died in the White House. The Grant, Taft and Eisenhower administrations had numerous frightened reports from White House employees about seeing Lincoln's ghost move about the Capitol's rooms. First lady and wife of President John Adams is regularly seen in the East Room hanging laundry, just as she did during their residency. President Woodrow Wilson's wife was determined to dig up Dolley Madison's (wife of President James Madison) rose garden, but she changed her mind after a disturbing ghostly visit. It seems First Lady Dolley Madison appeared to the workmen as they were starting to dig up the rose bushes and warned them not to touch her precious roses. Those rose bushes still bloom today in what is now called the White House Rose Garden. This ominous creature is called DC for short, and it is said to appear in the basement or the area of the White House known as the Crypt. To see it means that there is an impending national disaster. A guard claimed to see the cat as an innocent kitten that suddenly grew larger, into a frightening black cat, just before the 1929 stock market crash. Another sighting was allegedly witnessed shortly before John F. Kennedy was assassinated. There are many other ghost stories centered on the nation's capitol building. Many of the battlefields throughout United States' history are sites of ghostly apparitions. One of the most well-known ghostly battlefields is located in Gettysburg, Pennsylvania. The battle of Gettysburg resulted in the loss of nearly 8,000 Confederate and Union soldiers, with an estimated total of 51,000 casualties. There was also a loss of animal life, with over 3,000 horses slain during battle. It's no wonder there are restless spirits surrounding the battlefield and adjacent areas, where these military skirmishes were conducted over a three-day period. To give you an idea how massive this battle was, there were nearly 40 battlefield sites, and over 10 hospital locations, that compromised the Gettysburg battlefield. 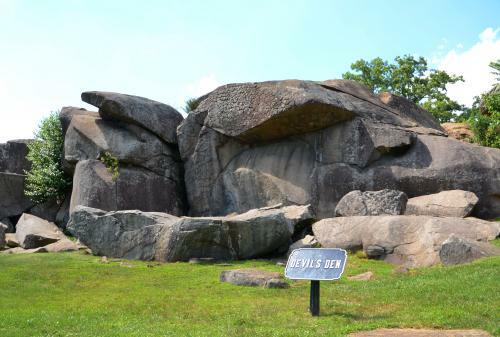 Devil's Den is considered one of the most active and haunted areas of the battlefield. A marksman was able to hide among the unique rock formation that creates a den-like area, as he killed several hundred soldiers before being spotted and killed by the Union army. A military photographer moved several soldiers' bodies so he could stage a better shot of the scene, and in doing so disturbed the soldiers' spirits. This farm was used as a field hospital for the Confederate army. It's believed that General Isaac Ewell, and 10,000 troops who died there, haunt the farm. Baladerry Inn was the site of a Union field hospital. Many guests who stay there experience ghostly encounters. It's believed that soldiers were buried on the property. Almost every known battlefield in the United States has some reported ghostly activity. Modern history is full of stories about historical ghosts. 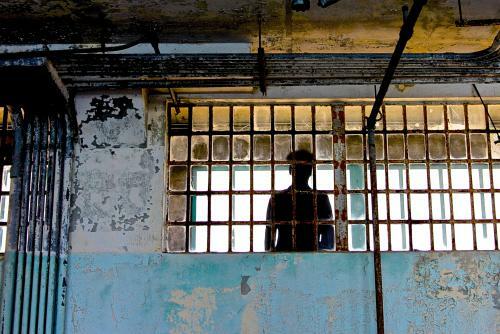 Haunted prisons such as Alcatraz often claim historic haunts like famous gangster Al Capone, who is rumored to haunt the prison. Walt Disney's ghost is said to haunt the happiest place on earth, Disneyland. 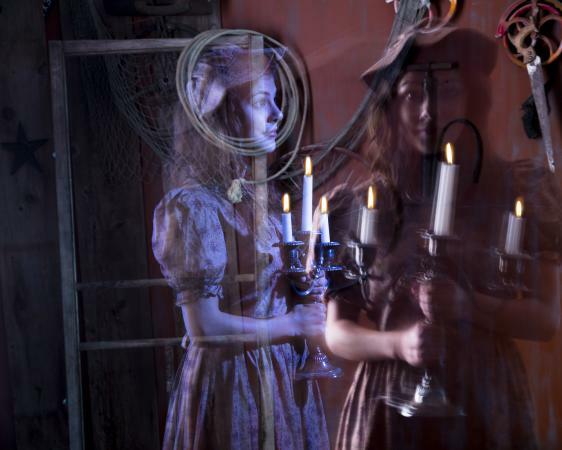 When you visit some of Europe's haunted castles, you may just encounter the spirits of historical nobility such as Anne Boleyn and Vlad the Impaler (Count Dracula). Many Wild West and Gold Rush towns are believed to be haunted by the spirits of miners who came west seeking their fortune. Many historic houses, such as the Whaley house in San Diego, are haunted by historical figures of the early pioneers who lived there. Historic ships have faced pirates, fought battles, and more, and many now have ghostly visitors from the past. There are thousands of ghost stories throughout America, featuring hauntings in famous hotels, inns, railroads, coastal cities, battlefields, and cemeteries. You just need to search a little to find personal accounts of these real life tales of hauntings.